Palmia Observatory: Getting past the bug; Miss USA 2017 studies science; AAS Planetary Habitability conference comments; Looking for dark matter in galaxy clusters; Looking at Chandra x-ray imaging; Funny cat video? 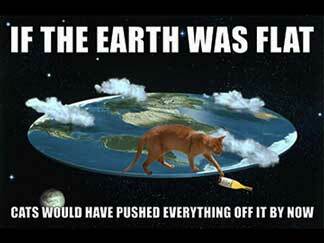 Getting past the bug; Miss USA 2017 studies science; AAS Planetary Habitability conference comments; Looking for dark matter in galaxy clusters; Looking at Chandra x-ray imaging; Funny cat video? Well this has been a very trying couple of weeks since our return from our Amsterdam river cruise, in that both Resident Astronomer Peggy and I came under the influence of some bug and got ill about a day after we stepped off the airplane. So, I had every intention of completing the attendance at the AAS Radio Observation of Planetary Habitability conference in Palm Springs, but found I had to drop out after only a coupe of days. I just couldn't keep up the required attention span and also didn't want to infect any other attendees. I also stayed away from the UCI Physical Sciences free breakfast speaker talking about how to weigh black holes. Oh, well, it is just getting so busy. So, only now do I have the energy to discuss some of what I learned there and also at one of the UCI physics colloquia events. AAS conference on Planetary Habitability and one of the physics colloquia, we should go over the upcoming schedule. My plan is still to be at OCA Astrophysics SIG, but unfortunately must miss the OCA Blackstar Canyon party due to our season tickets to the Chance Theater, which had to be postponed due to our Amsterdam river cruise, to just the same date. Darn! 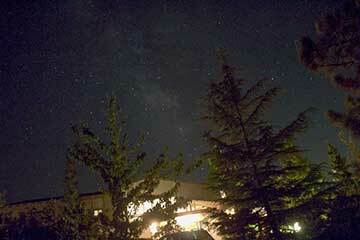 Just now that the weather is getting good for nighttime observing. Anyway, we don't want to miss this production of "Middletown", which some pundit described as "Our Town" on acid! I remember playing the Our Town choirmaster, when I was doing community theater in the last century, so I especially look forward to seeing Middletown. Also, I will see some of you and several thousand other power engineers and developers next week at Windpower 2017 in the Anaheim Convention Center. 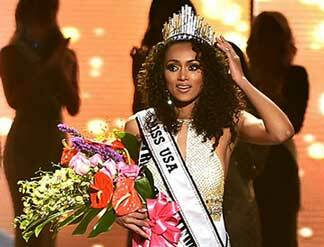 My first recognition that I was getting better and feeling better and ready to offer some conference summaries was when I happened to notice on TV the news about the winner of the Miss USA 2017competition. Hey, who says that studying science can't be fun! In taking notice of that new story, I knew I had to be getting better. Anyway, congratulations to Kara, who is a chemist working for the NRC. Ok, on to the AAS conference where maybe 60-80 scientists gathered to present and discuss some of their latest findings. The discussion was way beyond my understanding, but like many of the other scientific conferences that I attend, I started to pick up the main themes and areas of study that I would have to review more fully as part of my own homework. One thing I picked up, and I am not going to use my notes and reference any scientist by name, since what I heard and learned was just incidental to their main topic, was that the determination of a planet's habitability by just considering its distance from its star and the associated thermal balance to determine the planet's temperature, is too simplistic. You really need to start earlier and consider the formation of the planet around the young star and include any migration and other effects that determine the amount of rocky material and water and other gases in its atmosphere that might still be at the planet at its observed location. This is where the radio observation of the planetary habitability comes in to the picture and this is where I will digress from the conference proceedings and go more into my own homework to identify how many of the radio sources near these planets can be used to tell us more about the planet's habitability. Many presenters talked about astronomical masers, which everyone else present understood, and are but one of the major radio sources that modulate signal which tells us something of the gas and molecules around stars, but I had to go back and look into this topic and learn something about it myself. I remember when I was first in college, one of my electromagnetics classes talked about lasers and how they worked by creating a population inversion in a medium in an optical cavity between two reflecting mirrors, which enabled stimulated emission of a well coherent beam of light. In addition, the maser used the same type of setup, but occurred in the microwave region of the spectrum, but still required a microwave cavity of reflecting surfaces to generate and maintain the coherence emission of microwaves. Ok, so apparently something like this was going on in astronomical locations, but how could you have some type of microwave cavity in space? Well, it turns out that the nomenclature is not exactly true to its original engineering definition and the "cavity" in astronomy is really just a region in space where the population inversion can occur and the microwaves refracted from that region depend on the density and temperature of the atoms and molecules in that region. All that is needed is a source of radio emission to pump up the atoms or molecules and this source can be a central galactic blazer or some other source. The pumping process has to be "non-thermal" in order to create the population inversion and as usually happens in engineered lasers and masers a three level system is used where the pump raises the energy to the higher third level, which non-radiatively decays to the 2nd level, from which the stimulated emission of maser radiation can occur down to the first level. 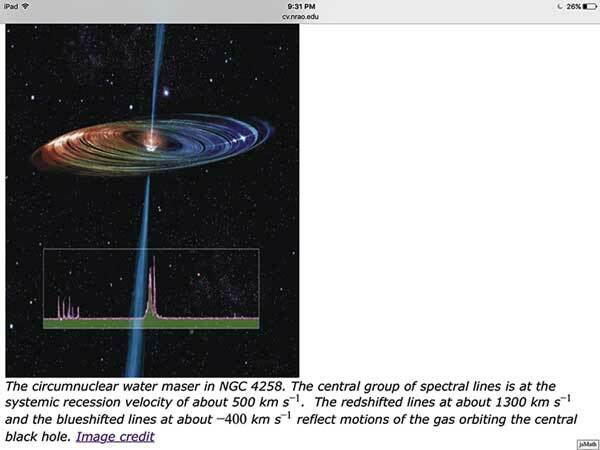 Check out the graphic below which shows some central source in NGC4258, which excites the water molecules, in this case, in the disk and the received radiation here on Earth shows the redshift effects for the circumnuclear water. This technique of looking for the available frequencies at which water molecules can create a maser is very good at identifying and tracing the flow of water though galaxies and their evolution. Initially, when the first astronomical maser, based on the hydroxyl molecule, was discovered in 1965, which was sometime after the invention of the laboratory maser, some folks wondered if the signal might represent LGM, but when one examines the bandwidth of the emission, one sees right away that the wide bandwidth is much more than is seen with naturally fabricated masers. The typical bandwidth for one type of astronomical maser is shown below. 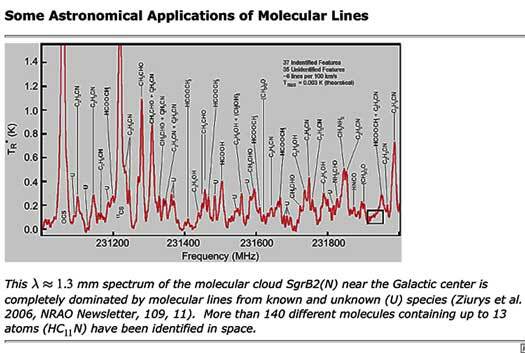 Many more molecules, in addition to the water and hydroxyl ions already mentioned have been observed in space. 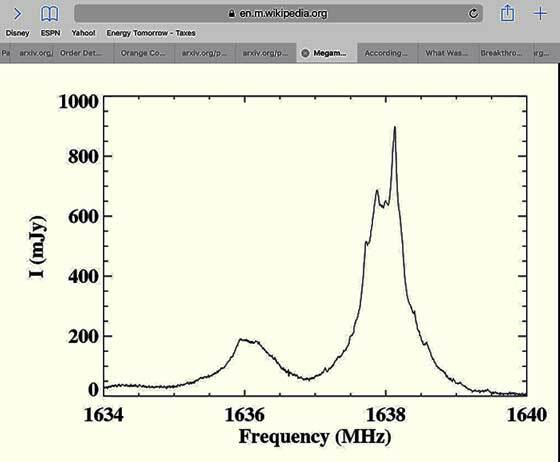 See the example spectrum below for possible maser operation. This means that maser detection can help trace various molecules and identify their locations in far away galaxies and molecular clouds. There were many other topics that came up at the AAS conference, but I want to mention just one more topic. One of the session chairs chose to ask his panel of experts a very different type of question from the technical type of questions that were mostly be asked and that was "what is the dodgiest assumption that you used in your study and presentation?" Well, some of the presenters seemed not prepared to answer this type of question, though some did eventually identify the shakiest of their assumptions. Many assumptions go into any of these studies but it was interesting to see who would identify and what they would identify as the dodgiest assumption. Pretty neat discussion! Now, I would like to comment briefly on the UCI physics colloquium that I could barely squeeze into the schedule and that was where Dr. Bulbul, MIT, described her special interest topic of "Utilizing Clusters of Galaxies to probe the interplay between baryons and dark matter." She talked about how galaxy clusters are one of the best indirect approaches and searches for dark matter, since only about 15% of cluster mass is made up of baryons, the rest dark matter. She is well recognized as one of the authors of papers that describe the stacking of multiple x-ray images of clusters in the search for any signal that might represent the decay of dark matter, of which the reported 3.5 keV x-ray line is the best example. The problem faced by these types of studies is to explain and calculate the background level of x-rays at or near 3.5 keV so that any excess can be attributed to dark matter decay, but this is always the hard part. She went on to explain that previous papers not withstanding that claimed to explain away the 3.5 keV excess, that current analysis still is consistent. It is just that more data is required to obtain a more positive result. Yes, astronomers always seek more data! Thank you Dr. Bulbul for a very interesting presentation! Now, I can't comment on the pros and cons of that study, but was intrigued by how x-ray spectra are gathered and stacked so my "homework" problem as to review that. As readers of this blog know, one of my goals is to gather stellar spectra which requires the telescope and mount to track the star good enough so that the stellar image falls directly on the spectrometer slit and maintains that tracking long enough for the dim stellar light, which normally is captured in just a few dozen pixels, to pass through the spectrometer and be spread out according to its wavelength over maybe a thousand pixels. So it takes much more time to collect a spectra than it does to just see the stellar image. Well, my first chore was to look up how Chandra telescope sensors record the x-ray images. 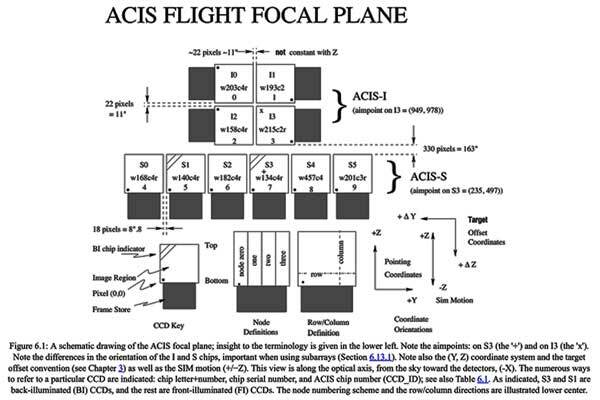 See the focal plane layout below. What I find is that the imaging portion of the telescope is made up of four integrated circuit sensor arrays mounted as shown. The x-ray image is directed to these four sensors (ACIS-I) and their associated 22 pixel spacing between the chips. The x-ray spectrometer focuses the spectra on the six chips (ACIS-S) laid out as shown. Wow, so right away we see that just collecting an image and a spectrum has all sorts of complications, one of which is the intentional spacing required between the individual sensor chips and this spacing must be taken out of the image during image and spectrum processing. Much more of the technical details can be found in the referenced report. So, one of the Chandra COSMOS Legacy survey images took a combined total of 4.6 million seconds of observing time to compete, some of which was needed to fill in the gaps in the missing pixels. See the tiling pattern for this study in the image below. 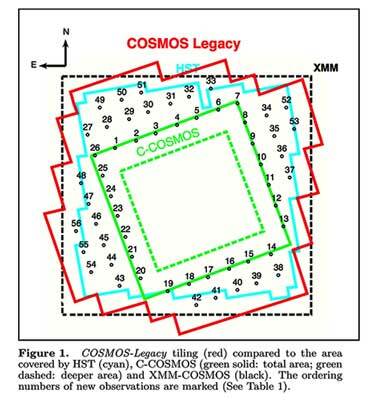 Notice how the COSMOS deep field study is shown in "red" and how the other deep field images from HST and XMM are shown overlaid in cyan and dashed lines. 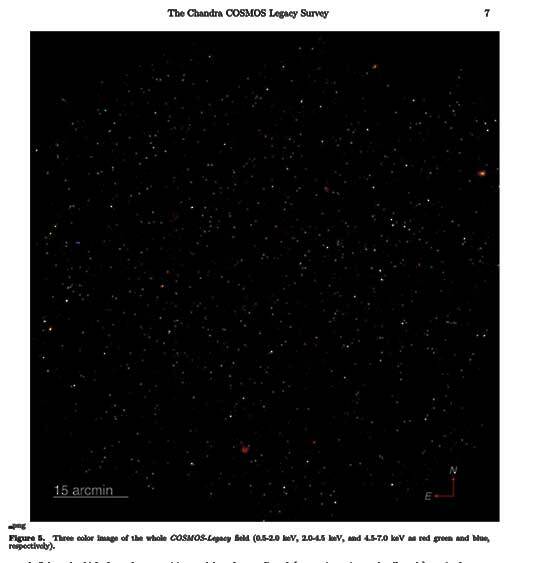 The numbers in this image correspond to the 56 pointing or aiming positions required to cover this wide field. Each of the 56 tiles were imaged for somewhere between 14,000 and 50,000 seconds, making the total at 4.6 million seconds. So, I find it really interesting how all of this stuff works together to get images and spectra of the field of view. There is so much more technical stuff mentioned in the referenced paper if you are interested. Just in case you have not seen the final survey image, check out the image below. Of course, those interested in the spectra of objects in this image have to access the other data files that are available. In fact, most of these Chandra files are available to the public and can be accessed and analyzed according to your own interests. Readers of this blog will recall that I mentioned in the October 15, 2015 post, the availability of free software called DS9 that can be used to perform your own analyses. Good luck if you choose to go down that path. Finally, since I am worn out, I will end with a funny post found on Facebook. Now, I don't get to Facebook very often, but when you are not feeling well, I found it kind of relaxing and interesting, especially this post by OCA Astronomer, Marty. I showed this post to Astronomer Assistant Willow and she just turned up her nose and said it wasn't funny and that she has never pushed anything over the edge. Anyway, thanks for that, Marty!